Rookie exhibitors have tapped into the extensive return on investment that these smaller stands offer. You’ll make a huge impact on your live audience, without having to worry about mastering an island exhibit setup. Smaller business owners simply may not have the manpower needed to successfully exhibit with a large booth. If you choose a more compact display configuration, you will be able to staff your booth without feeling like it’s too big. Easy to transport and even easier to setup, these lightweight exhibits epitomize the ultimate option for business owners who want a straightforward and seamless installation and dismantle (I&D) experience at all times. Chances are, like most business owners, you find yourself constantly monitoring your bottom line. Smaller portable displays can still offer a return on investment at a fraction of the cost. These smaller designs are a financially savvy choice. Don’t let their size fool you; no matter what industry you’re in or the size of your product line, you will be able to exercise maximum creativity during the design process. An innovative design team will work with you to capture the very essence of your organization, so you receive a one-of-a-kind customized final look. Product images play a key role in any trade show exhibit. You will work with your chosen design team to include high-resolution, top quality graphics throughout your booth that leaves a lasting impression. Do you think that accessories only work in island booths? Think again. 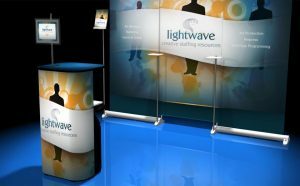 A reputable exhibit provider will also offer an extensive range of accessories that can be used with your portable displays. You can find shelving, literature racks, chairs, tables and even monitors; you’ll find exactly what you need to create a signature look. Best of all, these lightweight stands have proven that they can be used long after the event has ended. You will find a virtually endless list of ways to use your easy to setup stands throughout the year. Many businesses set them up in lobbies and conference room as large advertising billboards for visiting clients. They can also be used at recruiting events, as well as outdoor functions. In short, wherever your team goes in Austin, San Antonio or beyond, your portable displays can easily and conveniently go with them for the ultimate return on investment.